We take great pride and pleasure in sharing the great news that Dr Nirmala Subramanian one of our senior most Consultants and Professor Emeritus, Oculoplastic Surgery and Senior Consultant at the Department of Orbit, Oculoplasty, Aesthetic and Reconstructive Surgery has been honoured with the highly prestigious ‘APSI – Plastic Surgeon for the Year-2018 award’ instituted by the Dr KS. Shekar Endowment. It was a moment of crowning glory for the veteran and highly respected figure in the field with an international exposure and several ‘Firsts’ to her credit as she walked up to the dais to receive the award considered as the gold standard in the field of plastic surgery from Professor RP Sahi, Retired HOD-Department of Surgery and Professor ML Bhat Vice Chancellor King George Medical College and University Lucknow, to the thunderous applause of the Surgeons fraternity assembled in large number at the ‘APSICON-2018’ the ‘53rd Annual Conference of Association of Plastic Surgeons of India’ held at Lucknow in November 2018. The citation of the award describing the distinguished recipient as a ‘Dedicated Surgeon, Excellent Teacher and Avid Learner’ reflected the qualities of excellence in clinical care, knowledge acquisition and dissemination and research, the founding principles of the institution where she pioneered the ‘Orbit, Oculoplasty, Aesthetic & Reconstructive Services department almost 4 decades back and serves with utmost sincerity and compassion to this day. The Sankara Nethralaya family puts its hands together for a thunderous standing ovation to its beloved Dr NS and wishes her many more years of service to society, accomplishments and recognitions. Development of the LogMAR visual acuity charts in various Indian languages and installation of the same in public places to enable the general public do a self check of their visual acuity, a first of its kind initiative by the Elite School of Optometry made headlines when it was implemented a couple of years ago. A white paper detailing the creation and accuracy of this critical vision evaluation utility, authored jointly by the SN team of Dr Kalpa Negiloni, Deepmala Majumdar, Dr Krishna Kumar, Dr Ronnie George and Biman Sen with assistance from Dr Aditya Neog, Dr Medhi J and Choudhary Mitalee which was published in the Indian Journal of Ophthalmology, was awarded the AIOS-IJO Platinum Award for the ‘Best Scientific Paper’ for year 2018 at the 77th Annual conference of the All India Ophthalmic Society (AIOS) held at Indore. 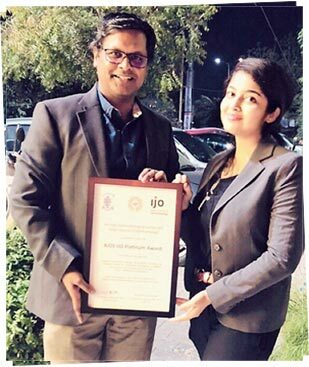 It was a proud moment for every member of Sankara Nethralaya as its internationally acclaimed expert in Uvea, a great teacher as much as a great clinician and researcher, Member International Uveitis study group and executive council member, International Ocular Inflammation Society, Dr Jyotirmay Biswas was awarded the highly prestigious ‘AIOS-Adenwala award-2018’ for his invaluable contributions to ophthalmology and the AIOS, at the 77th annual conference of the All India Ophthalmological Society held at Indore between the 14th to 19th February 2019. The scientific committee of the AIOS acknowledged and commended the veteran’s ‘Journey in Uveitis through 28 years’ which witnessed clinical care of the highest order, mastery over the subject exhibited through an astonishing number of publications and white papers on the subject and its related areas in highly prestigious peer reviewed journals and outstanding teaching and training endeavours in the field. The Sankara Nethralaya family salutes and congratulates Dr Jyotirmay Biswas its simple, unassuming Director of Uveitis and Ocular Pathology, known fondly as Dr JB, for this outstanding recognition in his field which makes him a member of a select group of ophthalmologists that includes Dr G.Venkatswamy, in the ‘200th year of Indian Ophthalmology’. We are proud of you Sir! 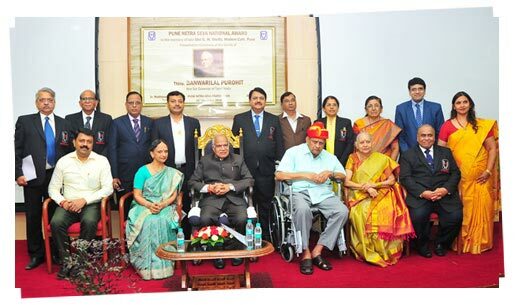 The evening of the 26th of December 2018 would remain etched in the minds of the large number of Sankara Nethralaya family members assembled at the Sri V.D.Swami Auditorium, located at its main campus, a colourful and joyous moment when the legendary ‘Pune Pagdi’ the bright turban which adorned the heads of Lokmanya Balgangadhar Tilak the fiery freedom fighter and Gopal Krishna Gokhale the moderate freedom fighter and social reformer, the bright headgear which had become a proud symbol of India’s nationalism and fight against foreign rule adorned the humble persona of the man who had been fighting all his life for freedom from blindness of his people, leading to a self reliant and independent life. 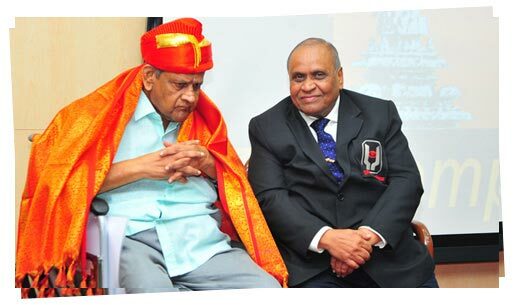 The occasion was the awarding of the first ‘Pune Netra Seva National Award’ instituted in honour and memory of Late G.M Shetty of Modern Cafe, Pune, a philanthropist who supported social causes generously, by the Pune Seva Netra Pratisthan a unique and pioneering service institution engaged in bringing back the light of vision and joy totally cost free to thousands of visually impaired in the rural parts of Maharashtra, for the past 40 years. 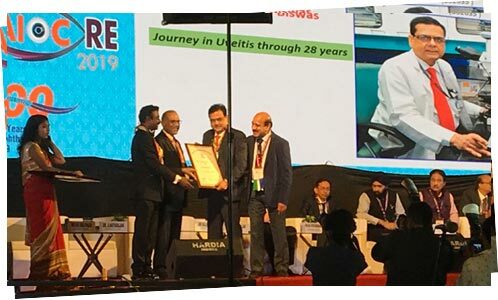 The award was instituted to recognize and honour an outstanding personality working in the field of ophthalmology, as part of the Pune Seva Netra Pratisthan’s 40th anniversary celebrations and the members of the executive committee of the organization chose Dr SS. Badrinath, Founder & Chairman Emeritus, Sankara Nethralaya unanimously for the same. The fact that the award was being conferred by an institution governed by the same philosophy and values, an institution that has been serving a large number of indigent visually impaired in the backward regions of the country for the same number of years as the institution started by the recipient of the award and the fact that it was being conferred by the first citizen of the state made it a very special award. Dr. Madhusudhan Jamwar, Founder, President and moving force of the Pune Seva Netra Pratisthan set the tone for the evening with a dash of nostalgia with his fond recollection of meeting the illustrious recipient of the award for the first time, at the All India Ophthalmic Congress (AIOC) at Amritsar in year 1979 when Sankara Nethralaya the institution started by him was a fledgling, one year old, 20 or so bedded hospital. Dr Jamwar’s compliment that no one was more deserving of the award than Dr SS.Badrinath, in view of his pioneering role in alleviating the suffering of the visually impaired both rich and poor, by leveraging a high level of knowledge and infrastructure of his institution was a clear indication that the humanitarian doctor had been a keen observer of his counterpart on the other side of the Vindhyas, who became his mentor and idol in the years that followed. Dr Madhusdhan gave a most absorbing account of how his dream institution the ‘Pune Purva Seva Pratisthan’ operated without a physical address, as an NGO of Doctors that relied on its team of service oriented consultants for the treatment dispensed and the local community for technical and infrastructural support. 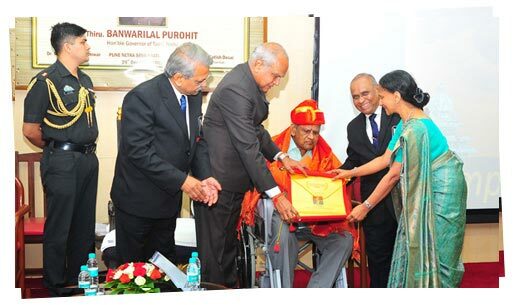 Dr Jamwar hailed Dr Prema Padmanabhan, among Sankara Nethralaya’s oldest and most versatile and accomplished surgeons being honoured on the occasion, as a most distinguished Cornea and Refractive services Consultant, a humble, soft spoken teacher and guide who has the pride of serving as the Honorary consultant to the President of India. Responding to the honour a visibly moved Dr Prema Padmanabhan hailed Dr SS.Badrinath as the Patriarch and Matriarch of the institution, she paid rich compliments to the Pune Purva Seva Pratisthan for its 40 years of glorious service to society. Declaring with pride that she had spent 1/3 of her life at Sankara Nethralaya under the mentorship of Dr SS.Badrinath whom she described as a sagacious mentor, chastising father, tender mother and guiding teacher all in one day, she added that he was a man who not only taught his team on how to treat patients but fellow human beings as a whole. The learned Doctor hailed the award recipient as a man who redefined outreach programs beyond boundaries, she expressed amazement on how many of his future plans which had a larger than life canvas and seemed like castles in the air would evolve as real, impactful initiatives with the passage of time, she cited the Mobile Eye Surgical Unit (MESU) and Tele-ophthalmology supported outdoor eye camps as case studies of the same. Beginning his address in a lighter vein by referring to the man being honoured as a ‘son-in-law’ of Maharashtra, the Chief Guest of the function His Excellency Banwarilal Purohit, the Honourable Governor of Tamil Nadu gave a most detailed account of the services rendered by the honouring organization, the man being honoured and the institution started by him. He cited their service, financial model technology adaption etc. The first citizen of the State appealed to doctors to synergize allopathic treatment with various indigenous forms of treatment like Ayurveda, Unani and Siddha for a holistic approach to treating diseases. Delivering the acceptance and thanks note on behalf of Dr SS Badrinath, Dr Vasanthi Badrinath, Director, Clinical Services, Sankara Nethralaya thanked Dr Madhusudhan Jamwar and his team for conferring the award and taking the trouble of travelling all the way from Pune to hold the function at Chennai. She expressed deep gratitude to the Governor for gracing the occasion in the midst of his busy schedules and for his kind words. Dr Vasanthi Badrinath used the opportunity to highlight Sankara Nethralaya’s pioneering role in introducing trail blazing concepts and practices in ophthalmology like group practice, treating all sub-specialties of ophthalmology under one roof, teaching and training initiatives, advanced community outreach facilities like the Mobile Eye Surgical Unit, developing ophthalmic technology, Electronic Medical Record, exhaustive ophthalmic research etc. Dr Vasanthi Badrinath expressed deep appreciation for the great work done by the ‘Pune Purva Seva Pratisthan’ towards eliminating blindness among the less fortunate sections of society in rural India and appealed to them to extend their services to places beyond the state of Maharashtra. Dr Prema Padmanabhan’s description of the lofty ideals and qualities of the man being honoured as the ‘Quintessence of a Karmayogi’ summed up the spirit of the day in a single sentence. Four decades of tender ophthalmic care to the nation’s future citizens wins its due recognition! Dispensing eye care to children has always been a challenge to ophthalmologists in view of the fact that they may not be able to express their discomfort or symptoms in a very clear manner, the way adults can. As a pioneer in eye care, Sankara Nethralaya has the distinction of operating a large, exclusive paediatric ophthalmology department which treats a large number of children from just born to teens, from all over the country, the department is also credited with having developed special diagnostic/treatment protocols to effectively treat this gentle segment. 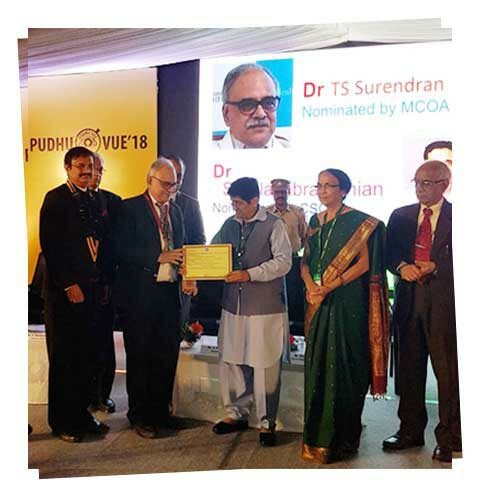 The 66th annual conference of the Tamil Nadu Ophthalmic Association (TNOA) conducted as ‘Pudhu Vue-2018’ on the 10th,11th and 12th of August at the Mahathma Gandhi Medical College & Research Institution, Puducherry witnessed the honouring of Dr TS.Surendran, Director- Department of Ophthalmology and Vice Chairman Sankara Nethralaya, who is credited with having pioneered pediatric ophthalmology as a specialty at Sankara Nethralaya and the man who trained and built a team in this niche specialty, with a ‘Lifetime Achievement’ award. The prestigious award presented by Ms Kiran Bedi, Lieutenant Governor of Puducherry and the loud applause and cheering by the large fraternity of ophthalmologists gathered at the venue came as a tribute not only to the veteran paediatric ophthalmologist’s professional skills, dedication, acumen and for successfully treating a large number of children during his long and glorious career, but also for his personalized and loving care to his little VIPs (very important patients!). The Sankara Nethralaya family salutes its Vice Chairman and Director –Pediatric Ophthalmology department on being accorded this high honour for his lifelong services, by a premium professional body and conveys its hearty Congratulations. Sankara Nethralaya has been a preferred eye care destination to patients not only from different parts of India but from all over the world, right since its early days. It has an exclusive ‘overseas patients’ department serving a steady flow of patients from the world over. 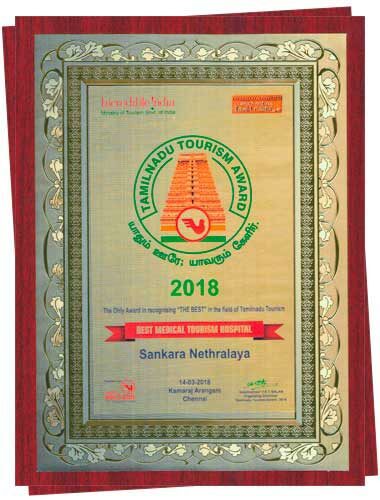 We take great pleasure in sharing that Sankara Nethralaya has been adjudged as the ‘Best Medical Tourism Hospital’ in the ‘Tamil Nadu Tourism Awards 2018′. The award was presented on the 14th of March 2018 at a function organized jointly by Ms Madura Travels and the Tamil Nadu Tourism Development Corporation, at Kamarajar Arangam. 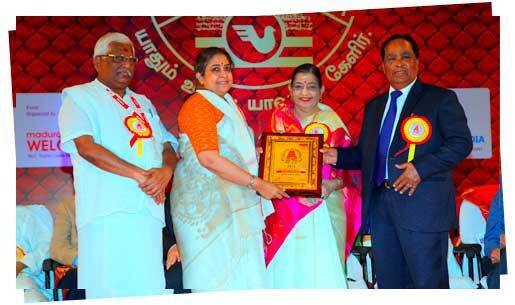 The award was presented by Singing Legend, Padmabhushan Srimathi P.Susheela and well known Industrialist and philanthropist, Chevalier, Kalaimamani Shri VG. Santhosham and received on behalf of Sankara Nethralaya by Srimathi Nirmala Kurien, General Manager, Human Resource Department. The Hindu Group Publishing Pvt Ltd, among the nation’s oldest and highly prestigious media houses honoured Sankara Nethralaya as one of the 21 healthcare institutions in the State and its Founder Dr SS.Badrinath for their service to society. The awards were presented by His Excellency Banwari Lal Purohit, the Honourable Governor of Tamil Nadu on the 17th of March 2018 at ‘Hotel Feathers’, Chennai and attended by Shri C.Vijaya Baskar, Health Minister and Shri J.Radhakrishnan, Health Secretary, Tamil Nadu. The event also witnessed the launch of The Hindu’s coffee table book honouring leading institutions which have contributed significantly to healthcare in the country. The first copy of the book titled ‘Doyens Guardians of Healthcare – Tamil Nadu 2018’, which has an exclusive chapter dedicated to Sankara Nethralaya was launched by the Governor and received by Shri Gopalkrishna Gandhi, former Ambassador of West Bengal. 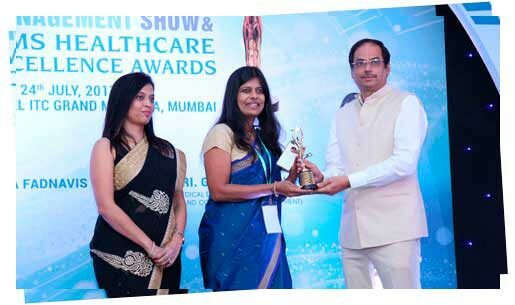 Vista India the publisher of Health & Fashion magazine recognizes outstanding medical professionals who have contributed to society through their service orientation, especially to the socially and economically backward sections of society, with the ‘Mayan Awards’ every year. This year too witnessed the recognition and awarding of eminent doctors from various specialties who had exhibited professional excellence and a spirit of service in discharging their duties. We take great pleasure and pride in sharing that the selection committee chose Dr Rajesh P.S, Senior Consultant and Dr Gajendra Kumar Varma, Associate Consultant, Sankara Nethralaya in recognition of their impeccable service to the indigent visually impaired in the most remote regions of the country, through the ‘Mobile Eye Surgical Unit’ (MESU). 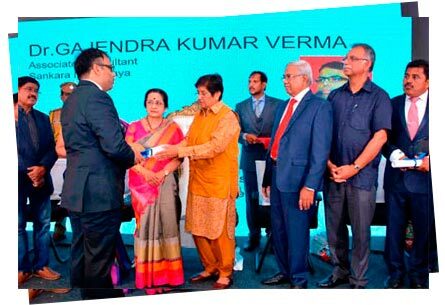 The awards were presented in a glittering ceremony held at Hotel Accord, Pondicherry on 2nd July 2017, by Ms Kiran Bedi, Lieutenant Governor, Union Territory of Puducherry. Sankara Nethralaya family lauds the commitment and service spirit of these two doctors which reflects the spirit of service and high standards of the institution they serve. ‘Vision 2020: The Right to Sight’ the national forum of concerned stakeholders comprising of NGO’s, government bodies and corporate entities, in the forefront of advocacy, knowledge sharing and ensuring best practices, to bring about effective and enhanced eye care delivery honours distinguished individuals who have stood, strived and contributed to its cause and whose efforts have brought about discernible changes to reducing blindness and delivering better eye care. 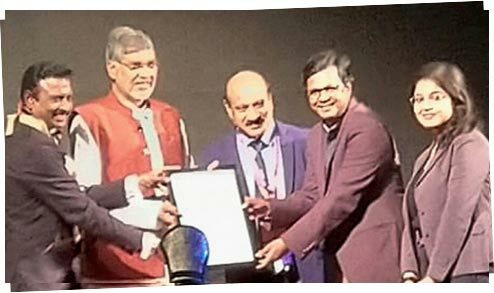 The Indian chapter of Vision 2020, the joint global initiative between the ‘World Health Organization’ (WHO) and the ‘International Association for the Prevention of Blindness’ (IAPB) conferred its highest and most prestigious award ‘VISION 2020: The Right to Sight- INDIA VISIONARY AWARD’ for year 2016 on Dr SS.Badrinath, Founder and Chairman Emeritus, Sankar Nathralaya. The awards were presented at the annual conference of Vision 2020 held on the 3rd and 4th June 2017, at the MGM Eye Institute, Raipur, Chhattisgarh and was attended by a large number of eye care professionals and administrators from all over the world. 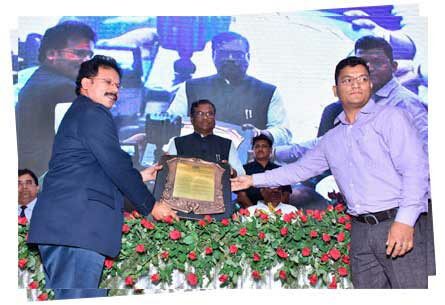 The VISION 2020: The Right to Sight- INDIA VISIONARY AWARD’ award was presented by the Honourable Minister of State for Health and Family Welfare, Shri Faggan Singh Kulaste and was received on behalf of Dr SS.Badrinath, by Dr R.R. Sudhir, Senior Consultant Cornea Services, Head Department of Preventive Ophthalmology & Consultant In charge – Electronic Medical Records, Sankara Nethralaya. 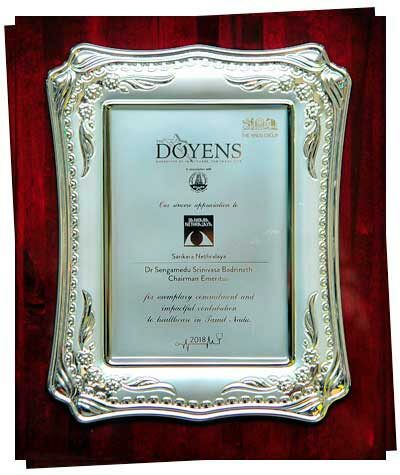 The citation accompanying the award highlights the recipient’s phenomenal role in reducing the burden of blindness in the country, initiating high level ophthalmic research, setting high ethical and operational standards in clinical care and administering an ophthalmic institution, adhering to values of transparency, high professional ethics and innovation in eye care delivery. It has an entire paragraph dedicated to the recipient’s role in conceptualizing, developing and operating the Mobile Eye Surgical Unit (MESU) the institution’s revolutionary operation theater on wheels. The Sankara Nethralaya family salutes its ‘Chief’ on being conferred this rare honour and reaffirms its dedication and commitment to live up to his dream of a blindness free India. CIMS Medica India, is a global leading provider of drug information, educational content and marketing services to healthcare professionals, pharmaceutical marketers and consumers. CIMS Medica India publishes leading drug directories such as CIMS, IDR and various scientific journals, like the Journal of Pediatrics, Obstetrics and Gynecology (JPOG), Cardiology Today, Orthopaedics Today & Medical Progress among others. It creates and distributes a wide range of healthcare information including medical and drug information systems, medical journals, customized communications and patient education in Print, Electronic, Web, Broadcast and Live Event formats. Its online brand www.cimsasia.com is among the most powerful drug search options for medical professionals. CIMS Medica joins hands with Hospital Management Show to select the nation’s best hospitals for different specialties on very stringent parameters, every year. 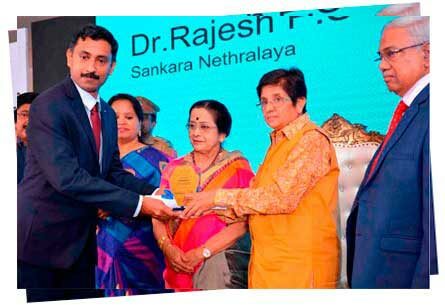 We take pleasure in sharing that Sankara Nethralaya was honoured as the ‘Best Hospital Unit in Ophthalmology’ for the 2nd year in succession by this leading disseminator of healthcare information. The awards were presented at a glittering ceremony held at the ITC Grand Maratha, Mumbai on the 23rd of July 2017, the award was received on behalf of the institution by its alumni Dr. Sahana Vaidya. It is a proud achievement for the hospital and the Sankara Nethralaya senior management takes this opportunity to congratulate and thank each one of you for your contribution towards maintaining high standards in every facet of our functioning. 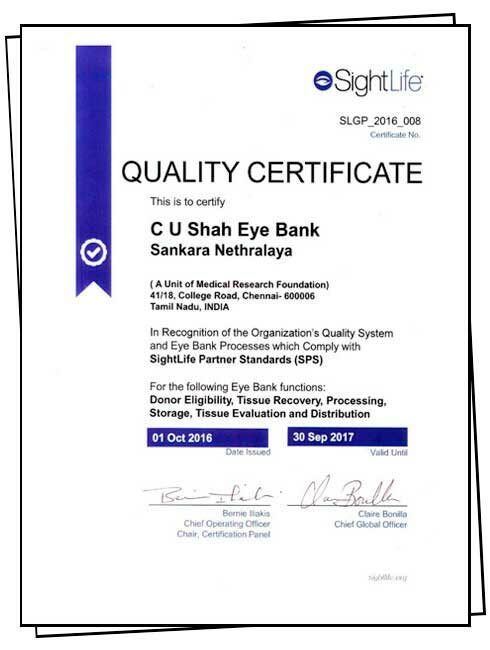 Sankara Nethralaya’s eye bank wins highest accreditation in its field! It was a moment of crowning glory for the Sankara Nethralaya family when the CU Shah Eye Bank, the institution’s most advanced and well equipped facility and key player in its battle against corneal blindness was awarded the ‘Quality Certificate’ by ‘SightLife’ a high profile member of the ‘International Agency for the prevention of Blindness’ (IAPB) and non-profit solely focused on eliminating corneal blindness the world over. The CU Shah Eye Bank named after one of the institution’s earliest and most generous supporters, has been a part of Sankara Nethralaya almost since its inception, the resource, a critical partner in treating corneal blindness has also been in the forefront of creating awareness on eye donations in the country and enjoys the reputation of being among the oldest and well administered eye banks in the country, although it was yet to be formally certified for its quality and functioning. 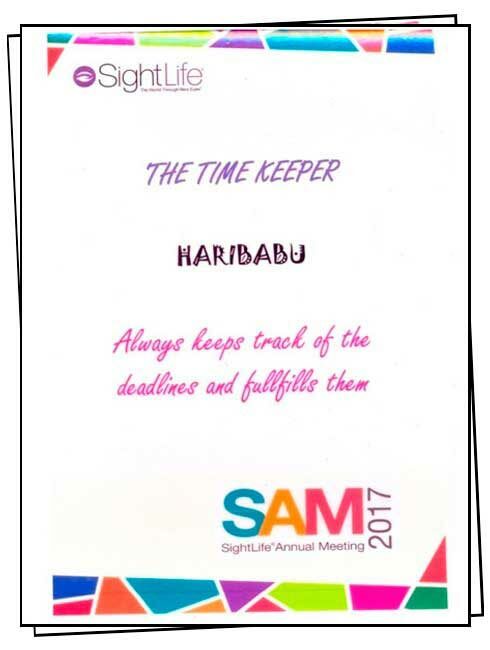 The long overdue recognition was fulfilled when SightLife, the world’s leading body which lays quality guidelines and norms, monitors and evaluates eye banks on the most stringent parameters the world over, accredited the facility with its ‘Quality Certificate’. The process was set in motion when Shri K.Hari Babu, Manager CU Shah Eye Bank and his team initiated the compilation of a directory on quality procedures, processes and best practices governing eye bank operations the world over combined with Sightlife’s own directives formalizing eye bank operations and quality standards for eye banks in India, in partnership with the Ministry of Health and the Eye Bank Associations of India. This exhaustive work proposed to serve as a ‘Standard operating Procedure’ (SOP) for the eye bank was prepared with expert guidance and assistance from Senior Consultants of the institution actively involved in the management and growth of the CU Shah Eye Bank almost since its inception, namely Dr Prema Padmanabhan, Medical Director, Eye bank, Dr Rama Rajagopal, Deputy Director, Eye Bank and Dr N.Radhika Senior Consultant, who also played the key role of the editor of the document. The SOP was presented to the world body and approved by it, as a next step the members of SightLife were invited for a first hand observation of the functioning of the CU Shah Eye bank in compliance with the aforesaid parameters. The auditors from SightLife conducted their audit on the critical functionalities and capabilities of an eye bank namely donor eligibility, tissue recovery, processing storage, tissue evaluation and distribution and completed the same in September 2016 the audit team was thoroughly satisfied with their observations, which manifested itself as an overwhelming 100% pass!! for the facility. 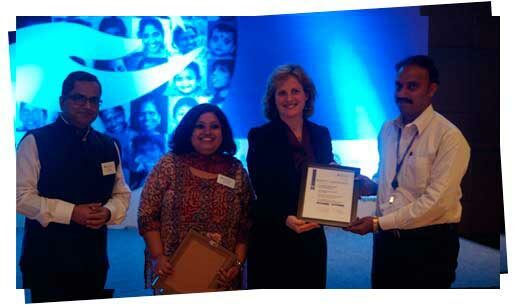 The ‘Quality Certificate’ was received from SightLife on behalf of CU Shah Eye Bank, Sankara Nethralaya by Shri K.Hari Babu, at a glittering awarding ceremony at the SightLife Managers Annual meet, held at the Taj Vivanta, New Delhi on 4th January 2017, the award was presented by Ms Claire Bonilla, Chief Global Officer, SightLife in the August presence of Ms Shubhi Sood, Quality Assurance officer, SightLife India and Shri Atul Kapoor, Asia-Pacific Manager, SightLife. It is noteworthy to mention here that the CU Shah Eye Bank is the first Eye Bank in the State to be honoured with this high accreditation. In a rare gesture of its appreciation of his initiative and efforts the leader and forerunner setting and implementing quality standards for eye banks, certified the Manager of the CU Shah Eye Bank and driving force behind winning the accreditation, Shi Hari Babu as a prompt and punctual ‘Time Keeper’ at the awarding ceremony. The Sankara Nethralaya family conveys its deep appreciation to Shri Hari Babu for his sincere efforts in streamlining and enhancing the operations of the CU Shah Eye Bank with expert assistance from senior members of the institution and expresses its hearty Congratulations!! To him for the honour bestowed on him and the branch of the institution managed by him, by the global leader and partner committed to eliminating corneal blindness. Three ‘National Board for accreditation of Healthcare Providers’ (NABH) accredited centers, an in-house laboratory quality certified by the ‘National Board for accreditation of Laboratories’ (NABL) the nation’s highest quality certifications and now an international ‘Quality Certificate’ for its eye bank; the wheel has gone a full circle indeed for an institution committed to quality and nothing but quality in all its endeavors.